When we think of the American West, our minds tend to conjure images of gunfighters, Indian wars and cattle barons. If we think of women at all, it’s most likely a saloon girl or Calamity Jane. Historians know that’s hardly the distaff story of the West. 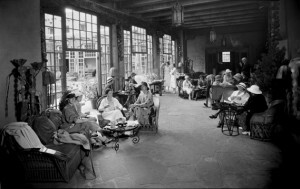 From Native women who oversaw corn production and the building of adobe homes to Hispanic weavers, artists and property owners, to Anglo businesswomen, physicians and environmental stewards, the female side of the story of the West too often seems to fade into the Victorian wallpaper. Up to now, that is. 1. Home Lands: How Women Made the West, June 19-Sept. 11, a traveling exhibition from the Autry National Center in Los Angeles, features additional materials from the History Museum’s collections. The largest of the summer’s four exhibits, it sweeps across the centuries in three regions: the Rio Arriba of northern New Mexico; Colorado’s Front Rage; and the Puget Sound. Evelyn Fite Tune, a longtime rancher outside Socorro, NM. Photo by Ann Bromberg, courtesy Palace of the Governors Photo Archives. 2. 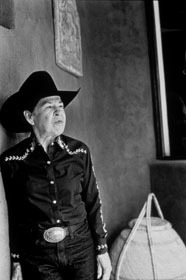 Ranch Women of New Mexico, April 15-Oct. 30 in the Mezzanine Gallery, highlights 11 women in this excerpt from an exhibit originally prepared by photographer Ann Bromberg and writer Sharon Niederman. 3. New Mexico’s African American Legacy: Visible, Vital, Valuable, May 15-Oct. 9 in the second-floor Gathering Space, tells the stories of the families who planted their roots and created a home in the Land of Enchantment following the Civil War. 4. Heart of the Home, May 27-Nov. 20 in La Ventana Gallery, spotlights historic kitchen items from the History Museum’s collections. Fabiola Cabeza de Baca. A Las Vegas, NM, native, this teacher and writer elevated both the art and science of homemaking from the Depression forward, blending traditional practices with modern-day conveniences. Beginning in the 1950s, her expertise went global when she started home-economics programs in Central and South America for the United Nations and became a trainer for the Peace Corps. Her story is included in Home Lands. Legendary cowgirl Fern Sawyer. Photo by Ann Bromberg, courtesy of the Palace of the Governors Photo Archives. Fern Sawyer. 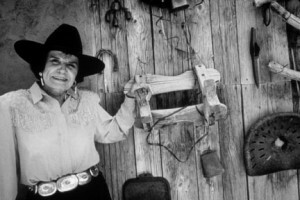 New Mexico’s best-known cowgirl spent 77 years living up to her motto: “Do all you can as fast as you can.” An inductee into the Rodeo Cowboy Hall of Fame, Cowgirl Hall of Fame and National Cutting Horse Hall of Fame, Sawyer passed away in 1993, still with her boots on, still in the saddle. Ranch Women of New Mexico includes her story. Clara Belle Drisdale. 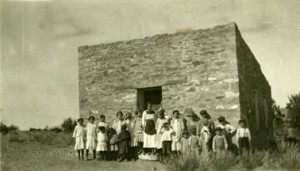 Photo courtesy New Mexico State University Archives. Clara Belle Drisdale Williams. In 1937, she became the first African American to graduate from New Mexico State University. After a career of teaching others, she received an honorary law degree from NMSU in 1980, along with an apology for how she was treated as a student. 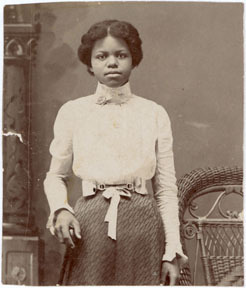 You’ll find her story in New Mexico’s African American Legacy. Other New Mexico women in Home Lands: Pueblo potter Maria Martinez; painter Pablita Velarde; photographer Laura Gilpin; archaeologist Bertha Dutton; santera Gloria Lopez Cordova; Santa Clara Pueblo artist Nora Naranjo Morse; and poet and playwright Joy Harjo. Artifacts range from a 1,200-year-old Mogollon metate to a 20th-century station wagon, textiles, clothing, pottery, paintings, photographs, sculpture, books, and an art piece made of computer components by contemporary artist Marion Martinez. To kick things off, the Museum of New Mexico Foundation is holding a $200-a-person party called Celebrate on Saturday, June 18. Put on your fancy Western wear and enjoy fine wines and creative cuisine in the Palace Courtyard. Learn more, including how to buy tickets by clicking here. Sunday, June 12, 2 pm: Symposium on “The Journey of the African American North,” including stories from Santa Fe and Española. Sunday, June 26, 2 pm: “Captive Women in the Slave System of the Southwest Borderland.” Lecture by James F. Brooks, president of the School for Advanced Research and prize-winning author of Captives & Cousins: Slavery, Kinship, and Community in the Southwest Borderlands. Sunday, July 10, 2 pm: “Fabiola Cabeza de Baca and The Good Life.” Lecture by Tey Diana Rebolledo, regents professor at the University of New Mexico. Sunday, July 17, 2 pm: “Moving Around to Settle In: Women of the Plains and Range.” Lecture by Virginia Scharff, co-curator of Home Lands and director of UNM’s Center for the Southwest. Sunday, Aug. 7, 2-5 pm: “Homespun: Northern New Mexico Spinning and Weaving Techniques.” Members of the Española Valley Fiber Arts Center demonstrate Pueblo, Navajo and Spanish techniques in the Palace Courtyard. Friday, Aug. 12, 6 pm: “Through Her Eyes: An American Indian Woman’s Perspective.” Lecture by Eunice Petramala, park ranger at the Sand Creek Massacre National Historic Site. Sunday, Sept. 25, 2 pm: Symposium on “Entrepreneurship in the African American Community,” from barbers to caterers, mechanics to artists. Home Lands is generously supported by Cam and Peter Starret, Ernst & Young, Eastman Kodak Company, the National Endowment for the Humanities, Unified Grocers, Wells Fargo, KCET and the Friends of the Autry. Local support is provided by Stanley S. and Karen Hubbard, Dr. Ezekiel and Edna Wattis Dumke Foundation, the Museum of New Mexico Foundation, the Palace Guard and the Montezuma Ball. Whether in person or online, it seems, you like us. You really, really like us. During the Oct. 16-Jan.9 run for The Threads of Memory: Spain and the United States (El Hilo de la Memoria: España y los Estados Unidos), the New Mexico History Museum/Palace of the Governors welcomed 19,337 visitors. That number included 22 school groups of 813 students from around the state, and an additional 1,054 children who came through with friends and families, or schools that did not use our school registration site. 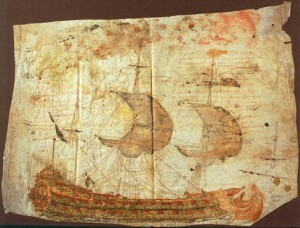 The French Ship La Belle, 1684. Sevilla. Archivo General de Indias. MP-Ingenios y Muestras, 9. The exhibition’s lectures and performances attracted another 848 visitors. We were honored to be chosen by the Archivo General de Indias (General Archive of the Indies) for the exhibit’s U.S. debut and delighted to work with our international partners, including the Fundación Rafael del Pino, the State Corporation for the Spanish Cultural Action Abroad (Sociedad Estatal para la Acción Cultural Exterior, or SEACEX), and Spain’s Ministries for Foreign Affairs and Cooperation and Culture. The web site remains a valuable tool for teachers and others interested in the roots of Spanish life in the United States. And if you weren’t able to see the exhibit while it was at the History Museum, it’s at the El Paso Museum of History through April 24; then at the Historic New Orleans Collection May 10 – July 10, before heading back to Spain. 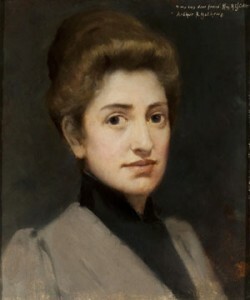 An 1893 portrait of Mary Jane Colter by Arthur Mathews, one of her professors. Photo by Tom Alexander, courtesy of the Pioneer Museum, Flagstaff, and the Arizona Historical Society. In 1910, a young architect named Mary Jane Colter was hired by the Fred Harvey Co. and the Atchison, Topeka and Santa Fe Railway. Over the decades that followed, she created some of the most iconic buildings along the railway and at the Grand Canyon. On April 1 and 2, the New Mexico History Museum joins with La Fonda on the Plaza — itself housed in a building she elevated with her interior designs — to explore Colter’s life and legacy. “A Mary Jane Colter Weekend: The Shaping of Southwest Style” is an exclusive event featuring lectures by noted experts and special dinners prepared by La Fonda’s Executive Chef Lane Warner. Tickets start at $100 ($50 tax-deductible); $200 for the events plus an April 1 sponsor dinner ($100 tax-deductible). The Museum of New Mexico Foundation is co-hosting the event with La Fonda on the Plaza. Proceeds benefit the New Mexico History Museum. Call 505-988-1234 or log onto www.TicketsSantaFe.org for tickets. Act now: Space is limited. On April 2, all participants will take in a series of lectures, a La Fonda dinner and an Actors Studio-style discussion of Colter’s legacy led by Dr. Frances Levine, director of the museum. South Portal of La Fonda Hotel (1925-45? ), designed by Mary Jane Colter. Photo by T. Harmon Parkhurst. Palace of the Governors Photo Archives, No. 054316. 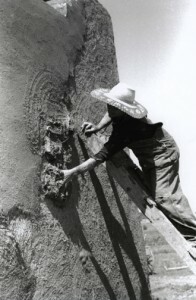 Santa Fe architect Barbara Felix, who was instrumental in the 2009 renovation of La Plazuela, La Fonda’s dining room, on “Preserving the Architectural Fabric of a Santa Fe Icon.” “Colter’s work has inspired me to be passionate about craftsmanship, the use of natural light, regional materials and the transformation of the ordinary into the magical,” Felix said. 6 pm: La Fonda, Welcome reception with hosted wine and light hors d’oeuvres. A limited number of special room rate of $109 a night is available for out-of-town guests. Call (800) 523-5002, ext. 1, or (505) 954-3500.